Secluded bays, spectacular beaches, and scenic fishing villages. From our 14 Croatian bases we offer a fleet of 320 high standard charter yachts. The divers Turkish coastline with its bays, islands and antic ruins is absolute paradise for sailors. Our bases are strategically the ideal starting point for your sailing trip. Endless coastlines with fantastic beaches, forlorn bays, picturesque fishing villages, typical taverns, good food and wine – the ultimate sailing estuary. Italy offers long sandy beaches, small islands, steep coastlines and natural harbors. Italy is also known for its well-known summer weather, the excellent Italian cuisine, hundreds of islands and the many sights. The Caribbean islands of St. Lucia and Cuba are the most unique sailing estuaries, with wonderful sandy beaches and turquoise waters for swimming and snorkelling. 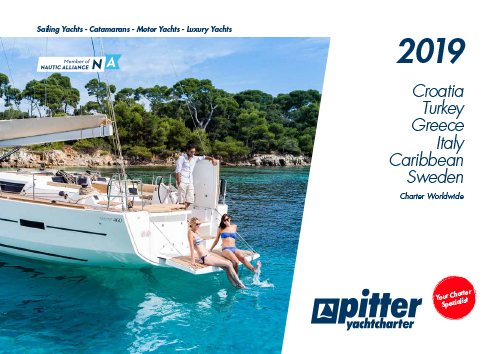 are available at Charter worldwide - Yachtcharter Pitter just offers first class ships of carefully selected partner. We are looking forward to start the new season 2019 with you. True to the motto: „Cast off into your holiday“ and chose your yacht, catamaran or motorboat from our large portfolio. With 495 well-equipped yachts on 24 charter bases in six countries and our extensive worldwide charter programme we open the new season. In Croatia we have 14 bases, 6 of which are our own. Here we have our new charter base Punat on the island of Krk, and our established Pitter base Veruda/Pula, great starting points for cruises in the northern Adriatic. In Greece you can use our new Pitter base in Volos and explore the wonderful sailing estuary of the das northern Sporades. Following the trend, you can find our growing charter fleet for Greece at our three bases in Lefkas, Lavrion and Volos. Also Turkey is growing in popularity amongst sailors. In the Caribbean, in addition to our base in St. Lucia, we have also planned a new base in Cuba. As new seasons bring new developments you will find, next to our large range of various yachts, models of our new selection of Dufour yachts. Numerous new yachts of different brands and types will complete our fleet in 2019. Check out our new charter catalogue and discover more. We strive to offer you the best service and good quality at fair prices. Your satisfaction is our goal! Through our Yacht-Pool Charter-Faitrag and the security with the Yacht-Pool security certificate, you are always on the safe side.